Well, if you were tough enough to stick around until the 2nd half of the 3rd quarter, you were in for quite a treat! For as bad as Michigan looked offensively for about 2 1/2 quarters of the game, they looked downright impressive for the rest. And luckily, we had a defense that was good enough to keep us in the game until our offense had enough time to figure out that this is a football game, and you score points by getting the ball into the endzone. 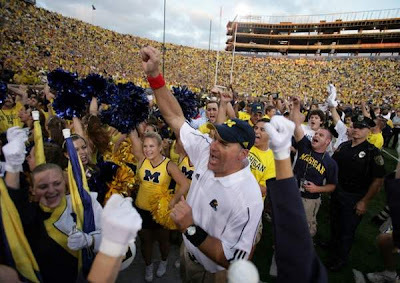 But, for as long as Rich Rodriguez is the head coach at Michigan, this will forever be his biggest 1st win. And hey, not a bad one at that. It's an in-conference win over a top-10 ranked opponent. But I'm not going to go all Mitch Albom and claim the new leaf has been turned over. Lest we forget, it's a long season, we still have an all-freshman team with new coaches and a new system. We're not going to win-out and go to the Rose Bowl. However, we did grow up a lot on Saturday. In about 15 minutes, Michigan players and fans, for maybe the first time, got a glimpse of why Roch Rodriguez was so worth the $4M pricetag. Both he and his stud S&C coach Mike Barwis. In the 2nd half, Wisconsin was gassed. And when Michigan players decided to stop turning the ball over, Wisconsin suddenly found out that they had no offense. Their 6-6 315-pound offensive linemen might as well have had concrete shoes on...they were worthless down the stretch. And Wisconsin's vaunted defense was sucking air right about the time Michigan's offense was hitting their stride. There is no doubt in my mind that this year's Michigan team is by far the most conditioned yet. But for the 2nd game in a row, turnovers were the thorn in Michigan's side. If they could've held on to the ball, the final score might have been more like 27-9. Wisconsin scored 16 points off Michigan turnovers. Boo from home. Don't pay for a ticket and take the seat of an honest fan who has to watch on TV. Either way, what was witnessed in the 4th quarter by those who stayed was nothing short of wonderful. When John Thompson took that interception for a touchdown, the euphoria in the stadium was palpable. You even felt it watching at home. There was something weird happening. For the first time, you felt that this team was changing right before your eyes. What a wonderful game, and an awesome experience for Michigan fans. From my perspective, I am very glad to see the Rodriguez stuck with Threet in the second half. While at the time, I was ready for David Cone to step in, it was refreshing to see that he stuck with his guy even though he struggled early. Threet can make plays, but I think in the 1st half, he was hamstrung by poor play-calling. Michigan was never able to run the ball until they started making passes downfield. Once they started doing that, the middle of the field opened up. That, coupled with the suddenly better blocking by the OL in the 2nd half, made for a much better attack. Word has it that John Ferrera was not working out so well at guard in the 1st half, so he was benched in the 2nd. Maybe that had something to do with it. But when Michigan found it's ground game, it found it just at the right time, as Brandon Minor took an option hand-off up the middle and broke it for a 37-yard touchdown run that suddenly made everyone at the game and at home think that this could actually happen. 3 seconds later (literally), John Thompson nabbed a tipped pass, and rode a train of 6 Michigan blue jersey's into the endzone. It may have been only 6 blockers in front of him, but he was being pushed by 95 Michigan players on the sideline and 100,000 screaming fans in the stands. There was no way he wasn't going to score. On Michigan's next drive, Steven Threet made one of his best plays yet as QB. He faked a handoff to Brandon Minor (who got drilled), and tucked the ball back into his arms, and ran straight down the field for 58 yards, setting up a redzone score by Sam McGuffie. No one saw that play coming from Threet. I think I could actually hear the collective scream by the fans in the stadium yelling "Don't Fumble!!!". But Wisconsin made it close. Michigan fell back into a safe-zone that let Wisconsin basically throw the ball down the field. 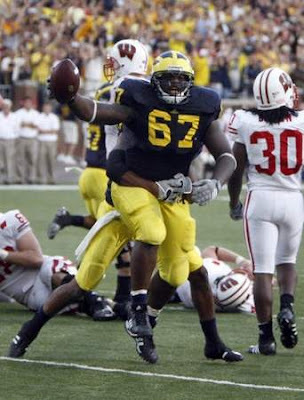 The fumble by Wiscy's QB, recovered by Terrance Taylor bought Michigan some time. If for nothing else, made Wisconsin burn all 3 of their timeouts. But Michigan fell 2 yards short of a first down, and punted away. Again, Michigan went into a soft-zone, and even throws into double coverage were completed. When they scored, it made me think "Well, seems about right." But the penalty on the conversion was obvious. Even Wisconsin didn't argue it. A few moments later, the onside kick flew out of bounds. The rest was glorious. A Gatorade bath for Rodriguez, and an awesome sight for the fans. 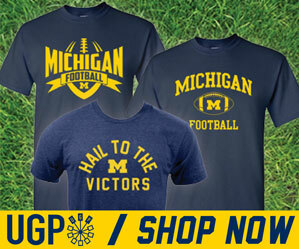 The greatest comeback in Michigan Stadium history. Photos copyright Detroit Free Press.